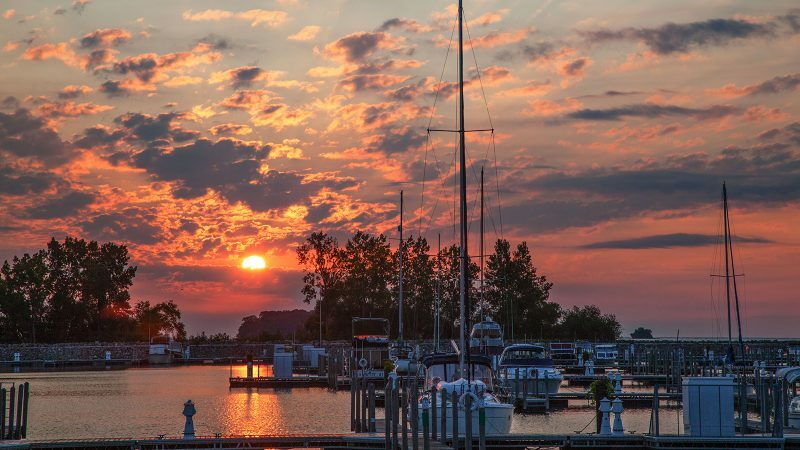 Middle Bass Island is one of 14 islands in the western basin of Lake Erie. Part of the US state of Ohio, it is 10 miles north of the US mainland and half a mile north of South Bass Island, with its well-known resort of Put-in-Bay. Middle Bass is also 2 miles from the Canadian border, which runs through the middle of the lake. 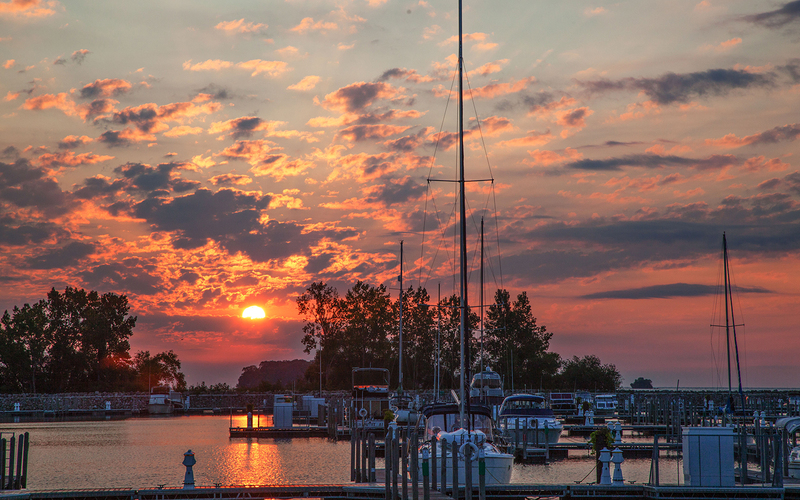 Lake Erie’s western basin has an average depth of only 25 to 30 feet and serves as an ideal habitat for fish. Middle Bass is low-lying and flat. Historically, it had five marshy areas, three of which have since been converted into marinas. Lake Erie water levels vary from year to year. In years with high water, storms may produce seiche conditions that temporarily raises lake levels. Flooding can cut off the east point from the rest of the island, limiting access to the west side of the island may. Houses built in flood zones have elevated main floors. Middle Bass Island’s 750 acres of land is shaped like a long-necked duck with vacation houses lining the shores. The island has 500 dwellings, with about 30 full-time residents and many more seasonal residents. It is accessible by ferry, boat, or small airplane. During the winter when the lake is iced over, the island can only be accessed by air. Several year-round residents commute to Put-in-Bay for work, and their children travel by boat or plane to attend school on Put-in-Bay. Middle Bass has two airports which service the island; the chief airport is managed by the Put-in-Bay Township Port Authority and a second private airport services one residential area of the island. Middle Bass State Park operates the island’s largest marina, conveniently located near the main dock. The marina has 184 boat slips, 150 of which have electricity. Middle Bass is referred to as the quiet island for active people. During the summer, boating, fishing, bicycling, jogging, birding, and kayaking are popular recreational activities. 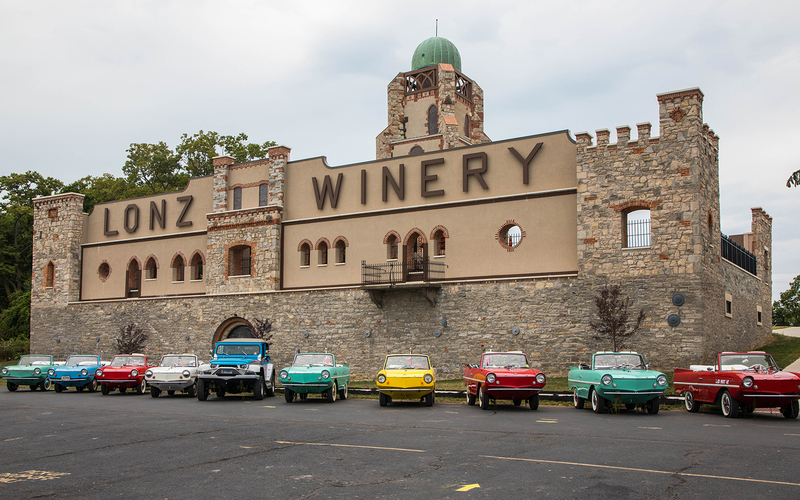 Middle Bass’s leading tourist attraction is the partly restored Lonz Winery located next to the main dock. 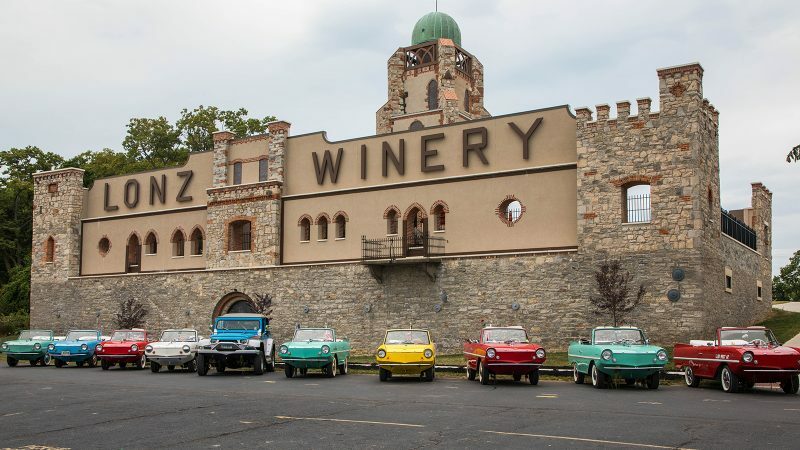 Lonz Winery and its predecessor on that site, Wehrle’s Winery, were in operation off and on between 1865 and 2000. It has since become part of the Middle Bass State Park and no longer functions as a winery but as a museum. On the upper level, open to the elements, is an outdoor patio complimented by a nearby sheltered pavilion. Both are ideal venues for weddings and concerts. The vineyards, which covered half the island from late 19th century until well into the mid-20th century, have completely disappeared. Two renovated, historic buildings are located near the center of the island: a one-room school and the island town hall. The school, built in 1864, is now used for a two-week summer arts camp for island children as well as for the Middle Bass Nature Camp. The town hall, built in 1877, is now used for Sunday church services and community activities, including a small library operated by volunteers. The town hall is the venue for the annual barbershop quartet concert. Since 1948, barbershop quartets from all over the Midwest gather on Middle Bass each year and hold a free concert for residents. The island also has one limited-access historic neighborhood – the Middle Bass Club – with privately-owned, brightly-painted, wooden houses dating from the late 19th century. The Club, which was started in 1874 by wealthy people from Toledo, Ohio, received visits from four US presidents: Benjamin Harrison, Grover Cleveland, Rutherford B. Hayes, and William Howard Taft. Middle Bass residents and the state of Ohio are fully committed to preserving the island’s natural environment. Middle Bass State Park occupies 16.5% of the island, most of its southern end. It currently has 20 non-electric camp sites with more planned for the future. Habitats include a small wetland, shrubby thickets, woods, and a small sand beach. The park is home to many migrant songbirds, making it a perfect spot for birdwatchers. Exposed limestone cliffs harbor endangered Drummond’s rock cress, Northern bog violet plants, and the very rare elegant sunburst lichen. The island’s 20-acre Kuehnle State Wildlife Area has the only sizeable marsh remaining on the island. The marsh provides habitat for a variety of herons, waterfowl, and shorebirds in season as well as Blanding’s turtles and Lake Erie water snake. Several nesting pairs of the magnificent bald eagle are located in the area. The 7.8-acre Middle Bass Island East Point Preserve is located near the tip of the island’s northeastern peninsula. The preserve overlooks Schoolhouse Bay, a popular, shallow-water destination for boaters and swimmers. The site features approximately 600 feet of natural shore with a pier near the eastern property line. The property has a diversity of habitats including natural beach lands, mature hardwood forest, and grasslands—the combination of which attracts large numbers of migrating bird and songbirds and provides habitat for the Lake Erie water snake and many more plants and animal species. Migrating songbirds rest here before winging across the lake. Hundreds of different species have been identified, making this an excellent bird watching area accessible only by kayak.